Russian President Vladimir Putin has accused Western governments of geo-manipulation of the Earth's environment through chemical spraying operations designed to alter the world's climate and poison the population. 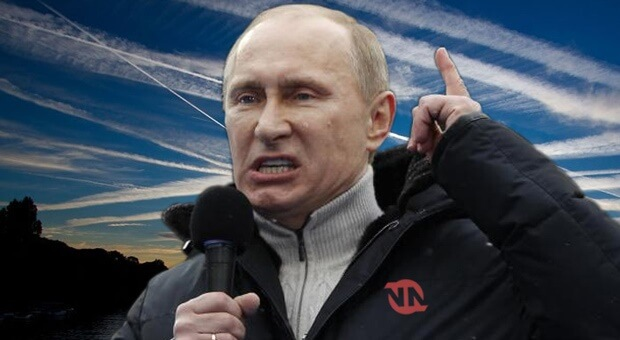 Russia's Premier was made the statements whilst speaking at a fundraising event and claimed that the spraying of chemicals into the Earth's atmosphere via chemtrails is funded by corporations and sanctioned by governments. Putin said that he was "deeply concerned" about the "uneducated risks" of altering our planet's climate and that it posed a "monumental threat" that was "against nature" and all in the pursuit of "population control and profit". The feeling in Russia is that Western governments and corporations are flying too close to the sun. But the problem is that they won't be the only ones to get burnt – the earth as a whole will suffer the consequences of their actions. Asked if he would advise against his citizens spending time in heavily sprayed areas of the world, Putin said he would not tell people where to enjoy their holidays. “But I do encourage people to educate themselves on this issue and make intelligent decisions."